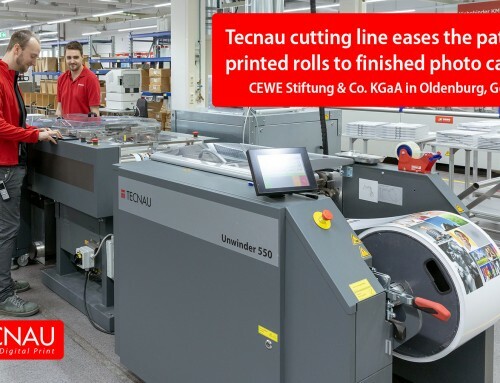 Rotomail has invested in a second Tecnau Libra 800 soft-cover book binding system to expand its production capacity for short runs and book on demand. Rotomail was established in 1996 as a Print on Demand service provider. In 2000 the company became one of the first adopters of inkjet technology, introducing color and developing trans-promotional applications. 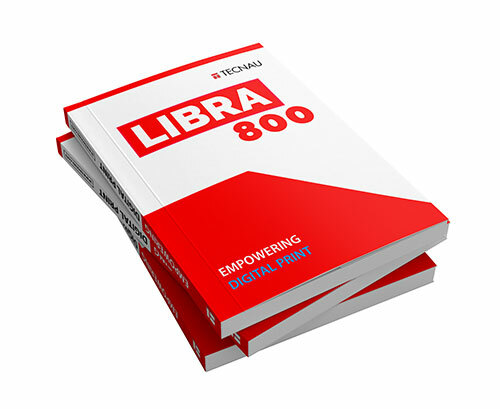 In 2003 Rotomail started diversifying into direct mail, commercial print and books market segments, and contributed to the development of the first Libra 800. In 2016 Rotomail installed the new HP T490 inkjet HDNA press, becoming the first user worldwide of High Definition Nozzle Architecture. In the Milan-based factory, rolls will be printed on the HP PageWide presses and finished nearline on Libra 800 in a roll-to-finished-book integrated process. 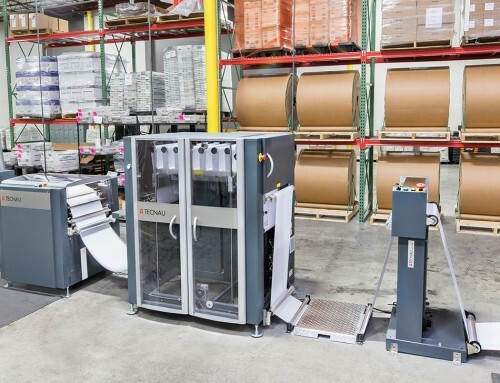 The modular system has been configured by Rotomail with one input channel from roll, along with slit merge and dual web cutter to produce variable book-blocks in height, width and thickness. Variable book blocks are automatically delivered to Libra VB Variable Binder connected online to Libra VT Variable Three-Knife Trimmer. The system feeds covers from roll and cuts them down in length and width with spine scoring according to the book block being processed, for complete variability book by book in the same run, minimized waste and without manual handling. The finishing process is integrated with Rotomail proprietary software “Bronte” providing a complete process control including order entry, production optimization and output tracking. 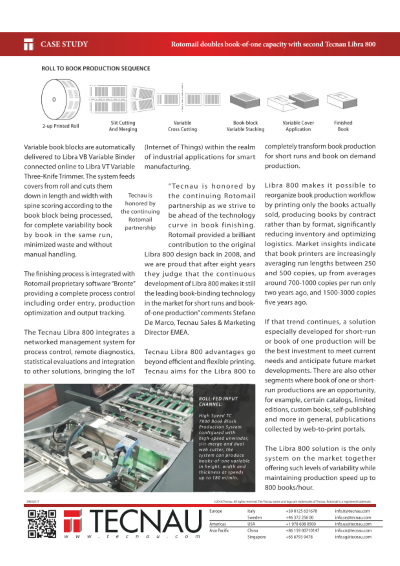 The Tecnau Libra 800 integrates a networked management system for process control, remote diagnostics, statistical evaluations and integration to other solutions, bringing the IoT (Internet of Things) within the realm of industrial applications for smart manufacturing. “Tecnau is honored by the continuing Rotomail partnership as we strive to be ahead of the technology curve in book finishing. 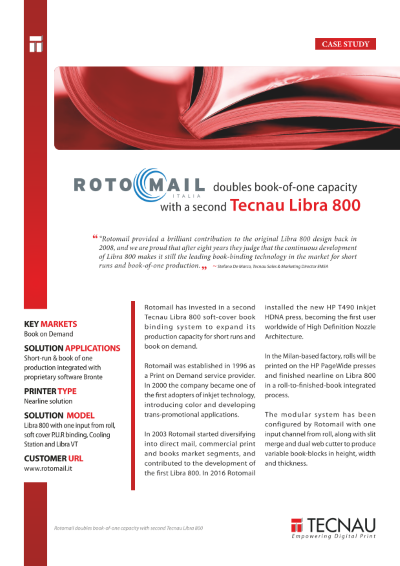 Rotomail provided a brilliant contribution to the original Libra 800 design back in 2008, and we are proud that after eight years they judge that the continuous development of Libra 800 makes it still the leading book-binding technology in the market for short runs and book-of-one production.”. Tecnau Libra 800 advantages go beyond efficient and flexible printing. 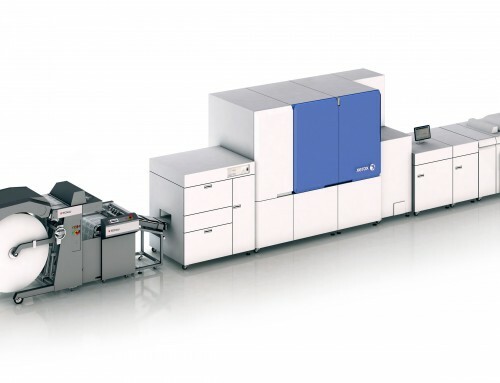 Tecnau aims for the Libra 800 to completely transform book production for short runs and book on demand production. 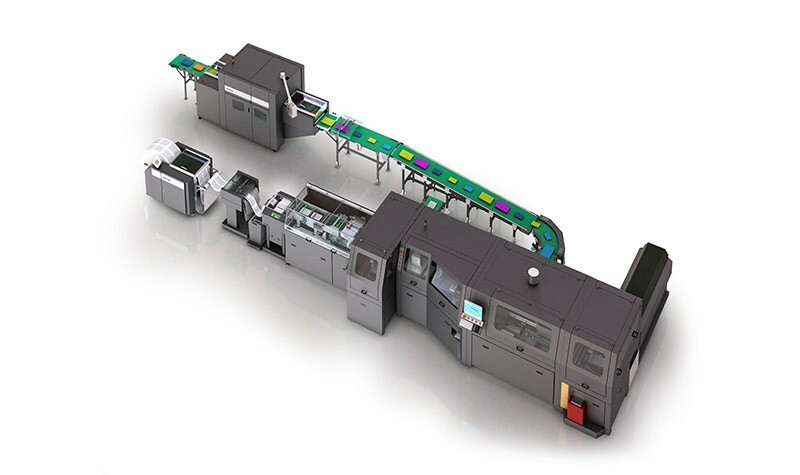 Libra 800 makes it possible to reorganize book production workflow by printing only the books actually sold, producing books by contract rather than by format, significantly reducing inventory and optimizing logistics. 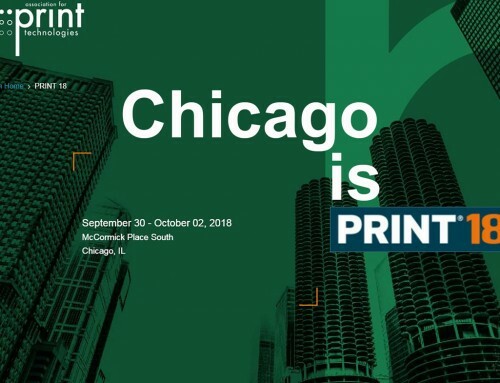 Market insights indicate that book printers are increasingly averaging run lengths between 250 and 500 copies, up from averages around 700-1000 copies per run only two years ago, and 1500-3000 copies five years ago. 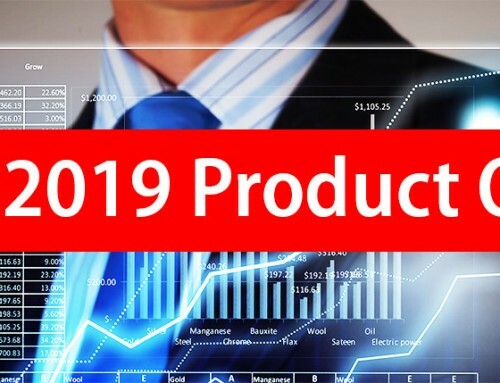 If that trend continues, a solution especially developed for short-run or book of one production will be the best investment to meet current needs and anticipate future market developments. There are also other segments where book of one or short-run productions are an opportunity, for example, certain catalogs, limited editions, custom books, self-publishing and more in general, publications collected by web-to-print portals. 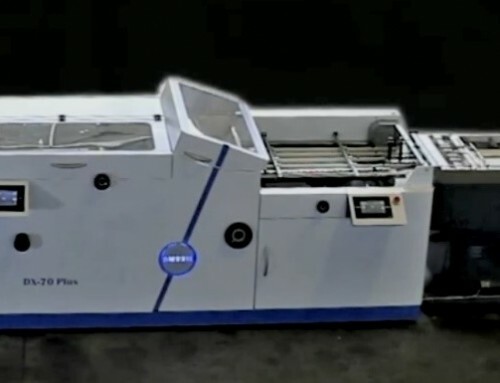 The Libra 800 solution is the only system on the market together offering such levels of variability while maintaining production speed up to 800 books/hour.